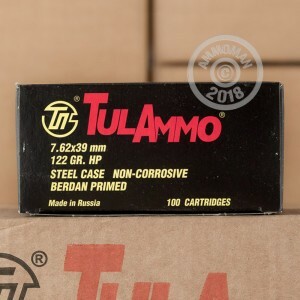 This steel cased ammunition from Tula is a big part of the reason shooting an AK or SKS is significantly less expensive than shooting many other firearms. Inexpensive yet reliable, these cartridges fire a 122 grain hollow point bullet at a muzzle velocity of 2,330 feet per second and produce good midrange performance for both hunting and range use. 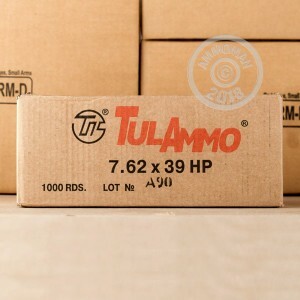 Tula ammunition is loaded in Russia using non-corrosive Berdan primers and non-reloadable steel cases. Buy this case or place an order for any other items totaling $99 or more to get free shipping from AmmoMan.com! Glad to have the opportunity to still buy ammo. Great price, good quality, excellent service, will buy it again. I recently bought a Ruger Mini-30. I bought a couple of 20 round boxes of Russian ammo just to try the rifle out. The rifle shot well. And the ammo was good. I found Ammoman on-line and tried a case of TulAmmo. I was very pleased with the results. With over 500 rounds shot, there were no misfires or duds. The accuracy is pretty good at 50 yards. I haven't tried 100 yards yet, but will be doing so this week. I will continue buying this ammo from the Ammoman. I am very pleased with ammoman.com, the service is great. 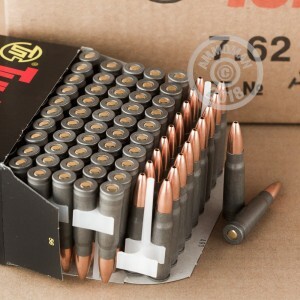 I placed my order, and about 3 hours later I got a call from a sweet lady, (i dont remember her name) but she took the time to make sure everything was correct with my shipping and billing addresses so that my ammo went to the right place. Several days later a 40 pound box of ammo is sitting at my door step. Was able to go to the range and put some rounds out. Shot about 200, not a single problem. Just make sure you slap the back of the mag against your hand to pack the bullets before shooting. From what I understand about these hollow points is they fragment on impact. At least thats what I was able too see through the clear gel. You don't really need to worry about over penetration in self defense senarios with this paticular bullet. It kind just, goes in, and boom fragments everywhere, the whole bullet brakes apart, and spider webs out. I would not want to get hit with one of these. Went thru 90 rounds without a gang up. Great!!! Will buy more !! Thanks ! Fast shipping and free !!! I have never had a problem with tulla 7.62*39, even using it in a ruger mini 30. I have altered the fireing pin in the mini 30. I am a life long machinist. I know how to solve problems with guns. I use other tulla calibres also, works fine. For what it is, its not bad ammo. Good product, no miss fires or failure to function. Worth the money. Would recommend to anyone.